The Carnival Freedom became the 22th ship in the Carnival Cruise Lines' fleet in February 2007. 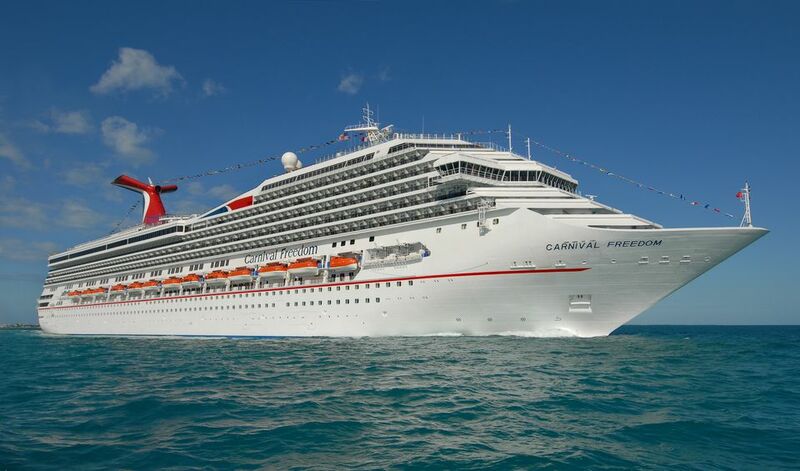 The 3000-passenger, 110,000-ton ship is a sister ship to the Carnival Liberty, which was launched in 2005. The Carnival Freedom offers a wide range of amenities including almost two dozen lounges and bars, a huge spa, jogging track, Internet café, and four swimming pools – one with a 214-foot-long water slide. The vessel debuted during the 35th anniversary of Miami-based Carnival Cruise Lines, a company that began with just one ship. Its parent company, Carnival Corp. & plc, has grown into the world's largest cruise company. The Carnival Freedom arrived in Venice, Italy, following a short voyage from the Italian Fincantieri shipyard on March 3, 2007. The cruise ship is 952 feet long and has 1,487 staterooms. The Seafood Shack was added to the Carnival Freedom in 2017 and is the newest dining venue on the cruise ship. The a la carte seafood venue is appropriately located within the ship's poolside Lido restaurant and offers a variety of fresh-from-the-sea delicacies such as lobster rolls, lobster BLTs, crab cake sliders, fish and chips, and a fried seafood platter with shrimp, clams, calamari, and fish. There are also buckets of fried buffalo shrimp and fried clams or a combination featuring both items. Diners can also enjoy steamed lobster, snow crab, and peel and eat shrimp, and oysters, all available at market price. The Carnival Freedom offers a wide variety of other casual and formal dining options, including the Chic and Posh formal dining rooms with diverse menus and wine lists; a casual poolside restaurant, Freedom Restaurant, with full breakfast, lunch and dinner buffets and a 24-hour pizzeria, Guy's Burger Joint, and the Blue Iguana Cantina. The ship also has an intimate reservations-recommended specialty steakhouse serving U.S.D.A. prime dry-aged beef, seafood and other cuisine. Dining room menus also include vegetarian dishes and children’s menus, as well as Spa Carnival Fare, delicious health-conscious menu items that are lower in fat, sodium, cholesterol and calories. The ship also features a patisserie and a sushi bar, as well as 24-hour room service and ice cream and frozen yogurt. The multi-deck atrium on the Carnival Freedom is bright, noisy, and full of activity. Like many large cruise ships, the atrium is the hub of the ship. The rest of the interiors take guests on a journey through the centuries by decade. Public rooms looking like they came from ancient Babylonia, the disco era, 19th-century Victorian, and the contemporary style of the 1990s, all celebrate many periods in time on the Carnival Freedom. Among other decades represented in Carnival Freedom’s public rooms are the American Revolution era of the 1770s in the Monticello Library; the 1910s in Scott’s piano bar, named after ragtime piano master Scott Joplin; the 1930s in Swingtime jazz club; and the 900s in the Dynasty Room, an homage to ancient China. Guests sailing on the Carnival Freedom will appreciate the ship’s 14,500-square-foot “Spa Carnival” facility, which features exercise equipment, a gymnasium, and body and facial treatments, including a number of exotic “European-style” therapies. The ship also features a salon offering a variety of hair, nail and make-up services. Like all Carnival cruise ships, the Carnival Freedom has lots of places for outdoor fun. Carnival Freedom also houses four swimming pools, including a children’s wading pool and an aft pool offering a 214-foot-long water slide. Carnival Freedom also features the line’s popular “Carnival Seaside Theatre,” a massive 270-square-foot LED screen on Lido Deck displaying movies, concerts, sporting events, and other programming, including a “Morning Show” hosted by the ship’s cruise director. Utilizing the same technology featured in large stadiums and New York’s Times Square, the state-of-the-art entertainment system includes a 70,000-watt sound system, providing concert quality sound, even outdoors. Galveston, Texas is the year-round home port for the Carnival Freedom, and the ship sails seven-day cruises to the Caribbean, Mexico, and the Bahamas.